About the seminar: As technology continues to proliferate, it becomes increasingly important to understand the information literacy experience that underpins peoples' engagement with their information environment in may contexts. In this seminar, Prof. Bruce will profile a range of information studies that explored the information and learning experiences of many groups, including educators, policy markers, and information professionals. Prof. Bruce has been engaging in information literacy research for more than twenty years and is one of the leading scholars in the field. About the speaker: Prof. Christine Bruce is Professor in the Information Systems School, Queesland University of Technology, Australia. She is also the Higher Degree Research Director of the School of Information Systems, convener of the QUT Higher Education Research, a memeber of US National Forum of Information Literacy Board of Directors, and an Australian Teaching Fellow. To register, please go to this page. 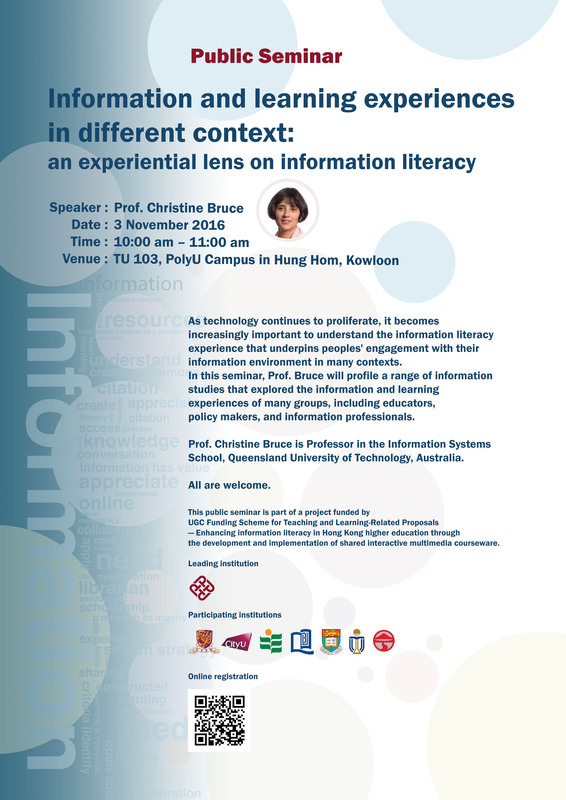 This public seminar is part of a project funded by UGC Funding Scheme for Teaching and Learning-Related Proposals-Enhancing information literacy in Hong Kong higher education through the development and implementation of shared interactive multimedia courseware.